【Best temperature for coffee】State-of-the-art technology makes coffee up to 185 Fahrenheit ( 85 Celsius ) which is the most suitable temperature for taste of coffee. 【Aroma mode】Turn on the "Aroma" key to control brew strength and the coffee maker will extract the coffee ground with hot water every 8 mins to make bold coffee for you. 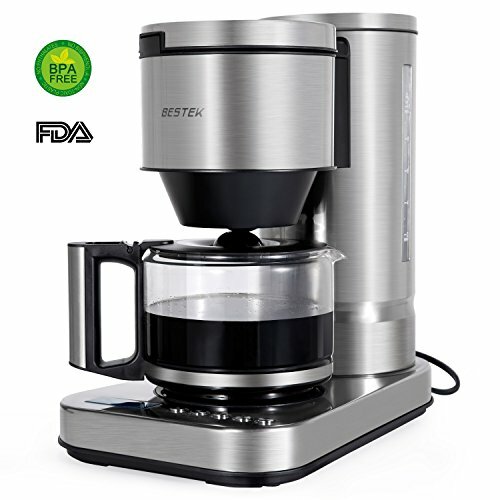 【24-hour programmable and auto-warming】Easy to program and set time to brew. Adjustable keep Warm temperature control. Automaticly keep the coffee warm for half an hour after the brewing cycle is finished and auto-off after 10 mins. 【Permanent reusable filter】Nylon filter ensures less coffee grounds into the glass, makes it easy to wash and for permanent use. Also compatible with basket-style #4 paper filters. 【Dishwasher safe glass carafe】BPA free and durable. No pain to clean.You can put the carafe into dishwasher.